KMT Waterjet is the most recognized waterjet pump in the World. 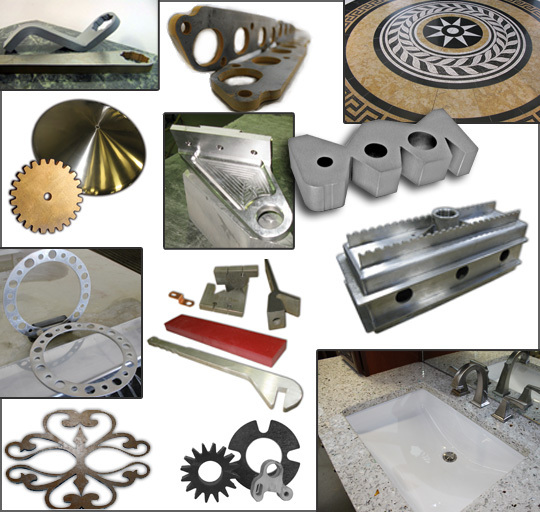 Companies in a variety of industries have been using KMT Waterjet cutting products with great effectiveness for more than 40 years. Thanks to its flexibility and reliability, waterjet technology is suitable for both large nesting productions as well as small series and complex specialized applications. Every day, innovative companies are discovering new applications for waterjet cutting, extending their production capacities and increasing their efficiency and profits. The commercial success, growth and survival of many companies and job processors who cut, form and machine materials are based on the use of waterjet machine cutting in their processes. What are the advantages of waterjet cutting as opposed to other cutting methods? The waterjet pump has been called the heart of the water jet system, pressurizing the water to thousands of pounds per square inch and then pushing it through to the cutting head, where it will be emitted at high velocities through a tiny orifice. With such an important role to fill, the pump must be able to meet high usage demands and precision requirements. An electric motor drives a hydraulic pump that pressurises the fluid circuit of the intensifier. There, the pressure is then increased twenty-fold and transferred to the high pressure water system. The water is drawn from the local supply network and pressurised by a booster pump to max. 7 bar. It then is fed through a filter system into the high pressure cylinder of the intensifier. The pressure intensifier includes a primary circuit which operates at 200 bar by means of an electrically driven hydraulic pump. The fluid is pumped alternately through a four-way valve to the right-hand or left-hand side of the hydraulic cylinder. The two piston rods installed in the hydraulic piston apply pressure to the water in the two high pressure cylinders of the intensifier. These are part of the secondary water circuit. Suitably dimensioned check valves on both ends of the high pressure cylinders control the input of fresh water into the cylinders and the supply of cutting water to the pump outlet. The water pressure of approx. 6200 bar is generated through a piston surface ratio of around 38:1. The high pressure pumps are equipped with an accumulator (pressure peak compensator) that ensures that the high pressure signal at the outlet of the high pressure pump remains more or less constant during the change of direction of the hydraulic piston. The high pressure pump is connected through a high-strength stainless steel pipe to the cutting head. The sapphire or diamond orifice in the cutting head focuses the pressure into an ultrafast waterjet (speeds of approx. 800 to 1000 m/s). To cut hard materials, the cutting power of the waterjet can be increased by adding an abrasive. In such units, abrasive, water and air are mixed in the mixing chamber of the cutting head, collimated in the focusing nozzle and accelerated. The resulting high-energy jet is capable of micro-eroding, i.e. 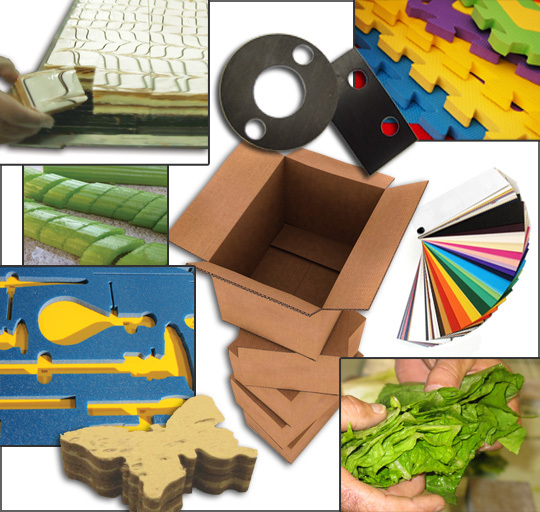 drilling and cutting, materials of great thicknesses and of the most diverse consistencies, such as metals, ceramics, rock and bulletproof glass. 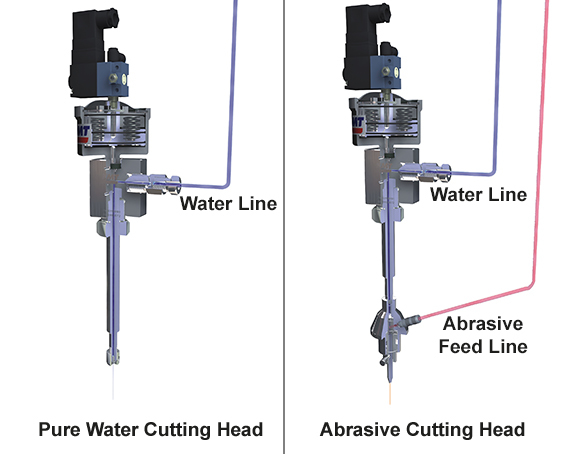 Water is fed through specially designed pressure-proof flexible pipelines to the cutting head. The cutting head consists of a pneumatically operated valve and a nozzle tube with a precious stone orifice (normally made in sapphire or diamond) at its outlet. The cutting jet exits the orifice at up to three times the speed of sound. A special abrasive head is mounted on the water nozzle. In this head, the abrasive is mixed with the pressurized water. The movement of the cutting head is normally CNC controlled through the waterjet cutting unit. Early detection leakage points protect the orifice body, nozzle pipe and nozzle nut against damage, as they indicate if connections must be retightened or seals replaced. Thanks to the unique design of the cutting head, seals can be replaced in less than five minutes and without tools. The precision performance combined with easy maintenance of KMT Waterjet abrasive cutting heads offer unrivaled value. Thanks to the simple design, orifices can be changed in seconds without the need for any tools!